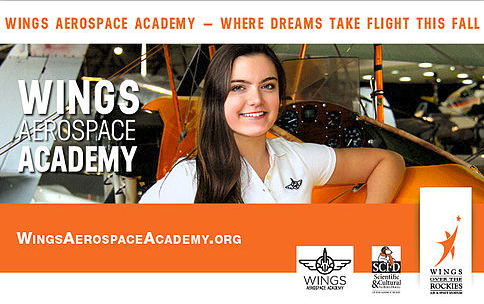 February 23, 2016 – Wings Aerospace Academy will be holding a parent information night at the Harrison Ford Theater on Wednesday, February 24, from 6:00-8:00 p.m.
During the parent session, visitors will take a tour of the Wings Over the Rockies Air and Space Museum; hear what a typical week at Wings Aerospace Academy is like; see video, photos and demonstrations; hear statements from current Wings Aerospace Academy students; and participate in a question & answer session. Wings Aerospace Academy is a tuition-free middle and future high school charter program providing hand-on aerospace experiences. Grades 5-9 launched in Fall 2016 and one grade will be added each year until the program reaches through 12th grade with the class of 2020 being the first graduating class. Wings Aerospace Academy offers a “blended learning” format, with on-line learning via core courses provided by a certified, multi-district charter school, the Elevate Academy; and aerospace-based STEM curricula provided by Wings in an aerospace settings. Another parent information session will be offered on Thursday, March 24, from 6:00-8:00 p.m.